What can you say? It lights the room with gravity! Ok, you had to put work into it to lift the bag, but it doesn't need batteries or the sun. 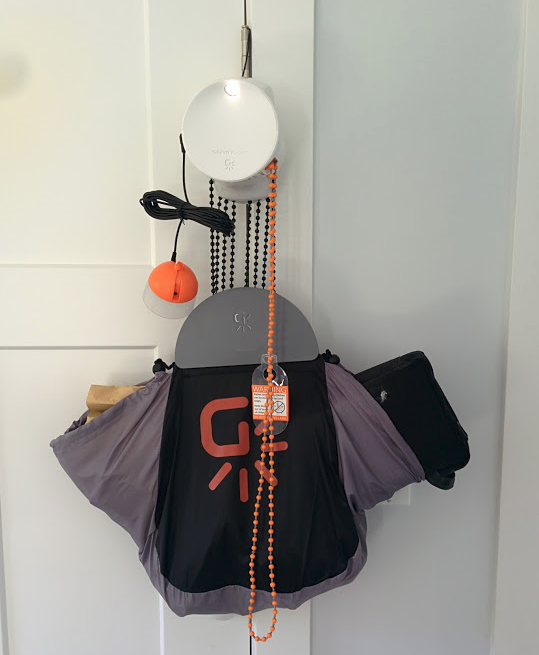 GravityLight has a great mission. Sometime back in 2015 I backed an indiegog project, Gravity Light 2 - Made in Africa. The project communicated well, which most often meant more prototyping and still no lights to ship. The wait isn't all bad, I'd rather wait for a light that works. For $70 we received one of the first GL02's made in Africa and 2 SatLights, the small teacup lights on a cord so you can spread the light around. FedEx delivered, everything arrived in seemingly good condition. It took longer to run aroudn the house to find enough books and things to throw in the weight bag than it did to set it up and try to use it. The SatLights are in two halves, the orange top and the frosted lower lense. If you twist the two halves to any of the three settings it turns off all the lights, turns on the main light or turns on that SatLight in addition to the main light - or that is what should happen. I can only get my SatLights to work if I pull one of the cords out of the jack about an 1/8th of an inch. I wrote the warranty email and asked about it. I'll update with their response. The gravity light should last about 20 minutes. I timed it at 15 minutes with the main light on and 8 minutes with all three lights on, but mine isn't at full height. I think the remaining chain would be enough to get it to 20 minutes without the SatLights and maybe 10 with them on. First Impression - not a bad thing to have laying around. It isn't super bright, but it can be powered by dirt (and muscle). The SatLight is enough to light a desk to read or write. The main light is enough to light a bedroom enough that you can see, but don't expect too much. I'd love to see the candlepower rating on this!